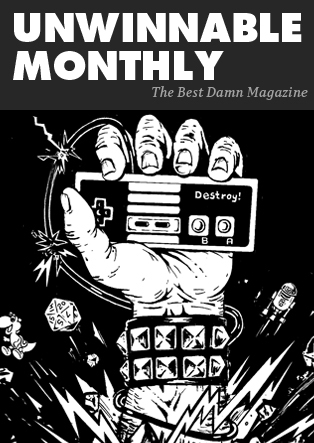 This is a reprint of the letter from the editor in Unwinnable Monthly Issue 96. You can buy Issue 96 now, or purchase a monthly subscription to make sure you never miss an issue! OK, I have a kid coming literally any second now, so I am going to do this lighting fast, OK? First, let us appreciate Zi Xu’s cover art. If I were in space, I would be in a constant state of prayer, and I’m an atheist. 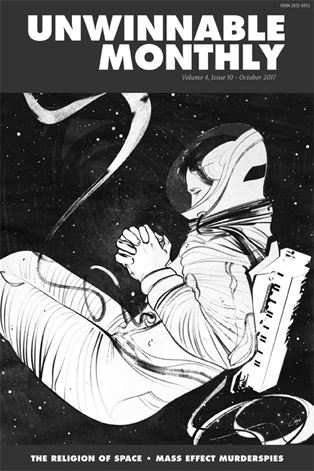 That image is your lead in to Oliver Milne’s fascinating feature on science fiction and how the language of space travel mirrors the langauge of religion. In another one of our accidental themes, Bill Coberly’s feature also hinges on space as depicted in Mass Effect, and the shocking amount of freedom Shepard gets as a Spectre. Like, a suspicious amount of freedom. So much freedom that maybe there’s something wrong with it. Read on to find out what Bill uncovers. In the columns, Gavin seems a little overwhelmed by his ever-growing backlog. Megan Condis is chilled by the implications the documentary The Confession Tapes has for our justice system. Casey Lynch, meanwhile, brings the metal (I’m digging the new Ancient VVisdom, Grave Pleasures and Korrupt). Brock Wilbur regrets checking out Geist for the Nintendo GameCube and makes us suffer along with him. Deirdre Coyle reveals her interesting relationship with Drakan: Order of the Flame, a game that probably does not deserve the amount of thoughtfulness she brings to it. Despite his best efforts, Corey Milne can’t escape Severed and Matt Marrone, to his dismay, has to escape his son. Speaking of sons, did I mention mine is coming ANY SECOND? I am calm, I promise. Not freaking out at all. But I didn’t have a lot of time to whip up a full column, so you get like four mini-columns instead. Sara Clemens picks up my deep think slack with an excellent essay on The Exorcist TV series, which I had avoided and, it seems, I am poorer for it. Weighing in on the great contet vs. creator debate, Rob Rich gave me the opportunity to use a header image of H. P. Lovecraft in this not as spooky as I’d like October issue. And finally, Jason McMaster professes his love for a little game called Destiny 2. Oh, and Brian Taylor’s excellent crossword is back! And there’s a profile of Zi Xu. And we’ve got a fun interview with the folks behind the VR RPG The SoulKeeper. And lists! OK, I gotta go pace. So much pacing to do. Pace, pace, pace.